The body of a teenager has been pulled from the American River northeast of Auburn. The 15-year-old disappeared while swimming in the Middle Fork of the American River in the Sliger Mine Road area. El Dorado County Sheriff’s deputies, along with officers from Cal Fire and CHP searched the river for the teen Friday afternoon. The teen, identified as Ronald Stewart from Garden Valley, was pulled from the water in the same area he was last seen. Here’s a way to turn the routine roar up I-80 into a jaunt through part of the Mother Lode in Placerville. 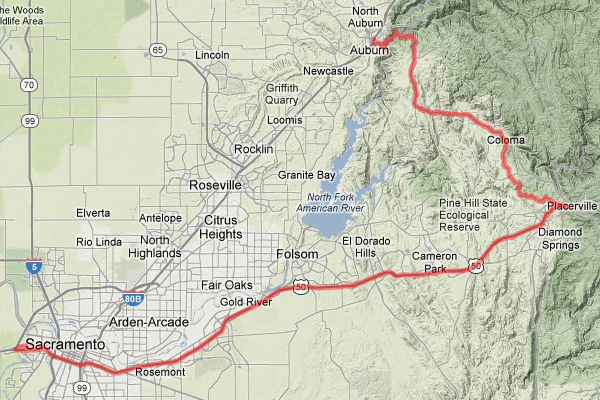 The route starts with US Route 50, which splits off I-80 just west of Sacramento. On this trip you stay on 50 to Placerville, then strike north across the watershed of the American River to Auburn, where I-80 is the ridge route to the crest of the Sierra Nevada. With minimal stops it takes a couple hours, but there are lots of places to linger. There have been several reports of a mountain lion along the American River in Rancho Cordova. At the Ancil Hoffman Park and golf area, seeing glimpses of wildlife is par for the course. You’ll glimpse a buck enjoying a sunset snack a pitching wedge away from golfers. Right across the road, who knows, it’s not a stretch to say you can run into just about anything out there. So, recent reports of a mountain lion sighting are not that unusual. Seasoned outdoor lovers like David and Kenesy with their dog Daisy say they’re extra aware these days. “I carry pepper spray for that very reason. I don’t know if I’ll be faster than a mountain lion but it’s worth a shot,” said Kenesy. But as they take a cruise on their kayaks down the American River, some of their neighbors spent the night getting an in-your-face lesson on co-existing with wildlife along the river.